Your next treasure might be found at this exciting event. The Friends of the Birmingham Public Library, over three hundred members strong, are sponsoring a “Gigantic Book Sale” Friday and Saturday, June 3-4, at the library’s downtown location. The sale runs from 9:30 a.m. until 5:30 p.m. both days. Items featured in the sale include pieces donated from private collections covering adult and children’s fiction and non-fiction, as well as DVD’s, CD’s, audio books, and videos. And it’s all for a good cause—proceeds will go towards the purchase of materials for our Birmingham libraries. A special preview night for Friends’ members is slated for Thursday, June 2 from 6:30 to 8:00 p.m. The evening will include a silent auction of interesting and unusual books. Individuals are invited to join the Friends organization with a paid membership at the door. The Friends of the Birmingham Public Library is a structured nonprofit association of individuals providing for various special needs of the Birmingham Public Library through community-based efforts. They attend to the library's needs, generate new ideas, offer advice and encouragement, volunteer their time and energy, and secure financial support. For additional information about our sale, please visit the Friends’ website at http://friends.bplonline.org/ or call 205-226-3761. The Birmingham Public Library (BPL) hopes that the following list may be of assistance to those affected by the recent storms and to those who would like to volunteer to help. BPL will continue to update this list regularly. If you would like to add additional information to help those in need, please post in the comments section below. Right-of-Entry Agreement (Private Property) form needed for the city and FEMA to start the clean up process on private property. Disaster related unemployment claims deadline is May 30. Call 2-1-1 in Alabama for assistance/information of any kind. It's like 9-1-1, except for non-emergency questions of any sort. Recovery Alabama Crowdsourcing meets geocoding in this database which covers topics such as assistance needed, information, infrastructure problems, items needed, medical needs, news stories, upcoming events and solutions. Alabama Severe Storms, Tornadoes, and Straight-line Winds Emergency Declared April 27, 2011 (EM-3319). FEMA’s mission is to support our citizens and first responders to ensure that as a nation we work together to build, sustain, and improve our capability to prepare for, protect against, respond to, recover from, and mitigate all hazards. BPL locations are waiving the fax fees for FEMA applications. Free legal help by the Alabama State Bar for tornado victims. Do you love to travel, explore and discover? Well, grab your library card and follow me. 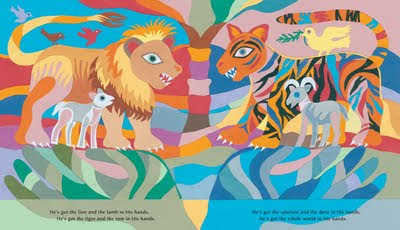 The Birmingham Public Library (BPL) will launch its 2011 summer reading program on June 1 at all 18 BPL locations. This summer travel to distant countries, explore other worlds and make exciting discoveries. Why not travel to South America, explore ancient ruins or learn more about the latest trends in science research? You might read a romance, mystery, thriller, fantasy or crime novel. Just get away from it all. Yes, it’s all there for you at your local BPL branch. We encourage you to participate in book discussions, programs, activities and events that your library has to offer. 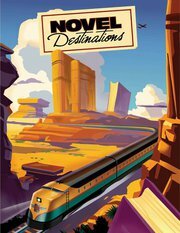 This summer adults can explore Novel Destinations by joining the Birmingham Public Library Adult Summer Reading Program. The program begins June 1 – July 31. We are excited to announce our new BPL Adult Online Summer Reading Program. Please visit our Birmingham Public Library Adult Summer Reading Program on Facebook. Register for the program to read books, post book reviews, participate in book discussions, complete reading challenges and win prizes. You may participate in the online and in-person summer reading program. Please register for the BPL Adult Online Summer Reading Program by clicking like at the top of the page. Your name will be placed in a drawing for a prize if you register for the program from June 1- 8. We will draw for the prize on June 9. However, you may register for the program at any time from June 1- July 31. Believe me, this summer we're destined for adventure! Legal Services Alabama has created a disaster manual to assist those affected by the recent tornadoes. "This statement of legal rights in situations that typically arise after a disaster was prepared by Legal Services Alabama, relying on information from its own websites and from various federal and state agencies. This document is intended for information purposes only. Readers should not interpret the contents as legal advice or legal opinion with respect to any specific facts or circumstances." This manual is also available in pdf format. The Birmingham Public Library (BPL) hosts another poetry slam on Friday, June 3 at the Central Library. Bards & Brews showcases both veteran slammers and first-timers. Held on the first Friday of each month, slams are emceed by poetry slam events director Brian “Voice Porter” Hawkins. Each contestant contributes $5 to the pot, and winner takes all. Southern Fried Slam rules will be observed. Craft beer will be available for sampling. You must be 18 years or older to be admitted, and 21 years or older to be served. IDs will be checked. Live music at 6:30 p.m. Call time is 7:00 p.m. Check out the Bards & Brews page on Facebook for more information. 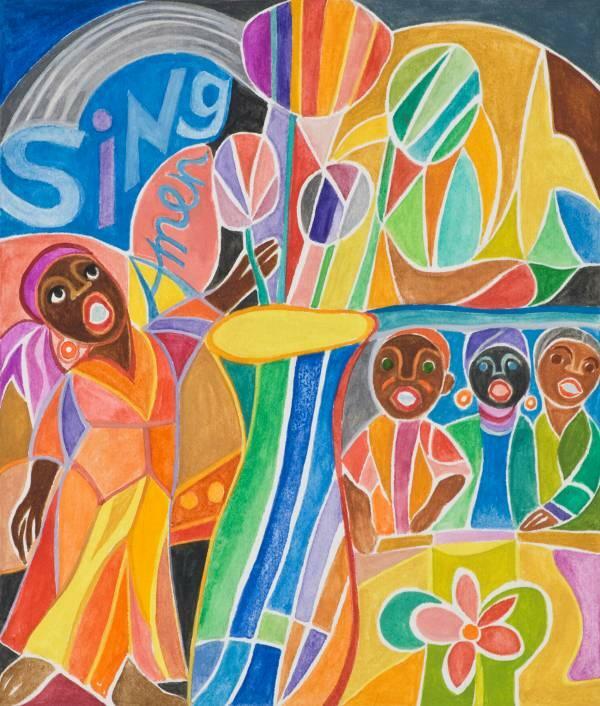 This program is made possible by grants from the Alabama State Council on the Arts and the National Endowment for the Arts. Word up, y’all! Our summer reading programs for Children, Teens, and Adults begin June 1. Visit any Birmingham Public Library location to learn more. 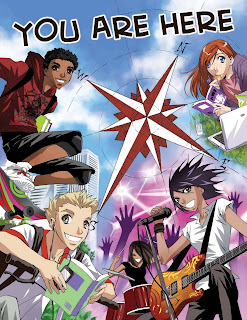 The Birmingham Public Library (BPL) is excited to launch its 2011 Summer Reading program on June 1 at all 18 BPL locations. BPL’s commitment to outstanding summer reading experiences for children, teens, and adults is reflected in the many and varied offerings for all ages and interests. This summer’s line-up surpasses the highly attended programming offered last year in which more than 6,300 patrons participated, more than 42,700 books were read, and 440 special events were offered with a combined attendance of more than 18,500 children, teens, and adults. Sign up on, or after, June 1 at any BPL location to take part in our free and fantastic Summer Reading program. The Birmingham Public Library is proud to offer the following sample of events for the month of June designed specifically for our adult patrons. Please check with your local BPL branch or at www.bplonline.org for more information. Avondale, Monday, June 13, 6:30 p.m.
Springville Road, Tuesday, June 14, 6:30 p.m.
Powderly, Friday, June 17, 1:30 p.m.
Central, Wednesday, June 22, 12:00 p.m.
Southside, Wednesday, June 29, 10:30 a.m.
Central, Wednesday, June 15, 12:00 p.m.
Springville Road, Tuesday, June 21, 6:30 p.m.
Central, Wednesday, Jun 1, 12:00 p.m.
North Birmingham, Monday, June 6, 11:00 a.m.
Springville Road, Tuesday, June 7, 6:30 p.m.
Southside, Wednesday, June 8, 10:30 a.m.
Ensley, Tuesday, June 14, 1:00 p.m.
Titusville, Monday, June 20, 11:30 a.m.
East Ensley, Friday, June 3, 3:00 p.m.
Springville Road, Tuesday, June 28, 6:30 p.m.
Avondale, Thursday, Jun 30, 2:00 p.m.
Can Jane Austen Change Your Life for the Better? William Deresiewicz is here to tell you that Jane Austen's biting social commentaries can improve your life while entertaining you. Deresiewicz is a former Yale University English professor turned professional literary critic. 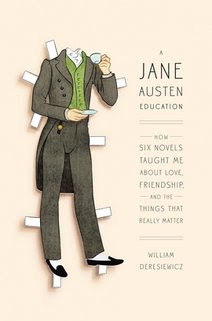 His book, A Jane Austen Education: How Six Novels Taught Me About Love, Friendship, and the Things That Really Matter, shows how Austen's novels were therapeutic at different stages in his development. In graduate school Emma taught the arrogant 26-year-old Deresiewicz that it's the small everyday occurrences of our lives that mold us into the people we become. Pride and Prejudice reminded him of how important it is to temper feelings with reason, and to be wise enough to learn from our mistakes. Mansfield Park turned a spotlight on the elite Manhattan crowd he was socializing with at the time, revealing how a lack of curiosity about the hows and whys of others' lives make for a narrow mindset that doesn't serve one well in life. The theme of friendship in Persuasion is perfect for a lesson about how to tackle the complexities of forging lasting adult friendships in this fast-paced society. Take home A Jane Austen Education to discover what life lessons Deresiewicz squeezed out of Sense and Sensibility and Northanger Abbey. His scholarly and personal takes on these six books should give even the die-hard Austen fans a fresh way of looking at her work. The Birmingham Public Library is proud to offer the following sample of events for the month of June designed specifically for our younger patrons. Please check with your local BPL branch or at www.bplonline.org for more information. Around the World in Twenty-Seven Hundred Seconds with the North Birmingham StoryGuys! North Birmingham, Wednesday, June 8, 10:30 a.m.
East Ensley, Thursday, Jun 9, 3:00-4:00 p.m.
Storytellers give a tour of the USA. Craft included. Woodlawn, Tuesday, June 7, 10:00 a.m.
Springville Road, Wednesday, June 8, 10:00 a.m.
East Lake, Thursday, June 9, 10:00 a.m.
Inglenook, Friday, June 24, 9:30 a.m.
Ensley, Wednesday, June 1, 1:00 p.m.
Inglenook, Friday, June 3, 9:30 a.m.
Woodlawn, Tuesday, June 14, 10:00 a.m.
North Avondale, Tuesday, June 14, 1:30 p.m.
Springville Road, Wednesday, June 15, 10:00 a.m.
East Lake, Thursday, June 16, 10:00 a.m.
Southside, Friday, June 17, 9:30 a.m.
Powderly, Monday, June 20, 10:00 a.m.
Titusville, Tuesday, June 21, 10:30 a.m.
Smithfield, Wednesday, June 22, 10:00 a.m.
Avondale, Wednesday, June 22, 2:00 p.m.
West End, Thursday, June 23, 11:00 a.m.
Eastwood, Friday, June 24, 10:45 a.m.
Five Points West, Thursday, June 30, 10:00 a.m.
Powderly, Tuesday, June 7, 10:00 a.m.
North Birmingham, Thursday, June 9, 10:30 a.m.
Central, Tuesday, June 14, 10:30 a.m.
Avondale, Tuesday, June 14, 6:30 p.m.
North Avondale, Tuesday, June 21, 1:30 p.m.
Titusville, Tuesday, June 28, 9:25 a.m.
Woodlawn, Thursday, June 30, 10:00 a.m.
Ensley, Wednesday, June 22, 1:00 p.m.
North Birmingham, Wednesday, June 29, 10:30 a.m.
Smithfield, Tuesday, June 7, 10:00 a.m.
Inglenook, Friday, June 10, 9:30 a.m.
Powderly, Monday, June 13, 10:00 a.m.
Titusville, Tuesday, June 14, 10:30 a.m.
Ensley, Wednesday, June 15, 1:00 p.m.
North Birmingham, Thursday, June 16, 10:30 a.m.
Eastwood, Friday, June 17, 10:45 a.m.
Five Points West, Wednesday, June 23, 10:00 a.m.
Southside, Friday, June 24, 9:30 a.m.
West End, Thursday, June 30, 11:00 a.m.
Books come to life with Ms. Meaghan, a member of the Alabama Symphony Orchestra. Rhythm instruments provided, or bring your own. Twenty-four hour advance registration required. North Birmingham, Thursday, June 2, 10:30 a.m.
Southside, Friday, June 3, 9:30 a.m.
Powderly, Monday, June 6, 1:30 p.m.
Titusville, Tuesday, June 7, 10:30 a.m.
Smithfield, Wednesday, June 8, 10:00 a.m.
Ensley, Wednesday, June 8, 1:00 p.m.
West End, Thursday, June 9, 11:00 a.m.
Central, Friday, June 10, 10:30 a.m.
A tantalizing trio of timeless tales from India, China, and Native American Indian lore are given new life through the magic of puppetry. Twenty-four hour advance registration required. 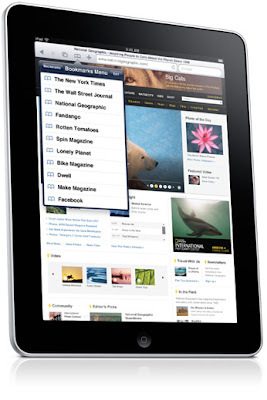 Avondale Library Tuesday, June 28, 6:30 p.m.
Alabama Power is donating forty iPads to four charitable and educational institutions. The Birmingham Public Library (BPL), along with the Mobile Public Library, Montgomery City-County Library, and Children's Hospital, will each receive ten iPads to help with their education and literacy outreach efforts. The donation of the iPads was announced during the “Playtime Extravaganza” carnival at Children’s Hospital, the closing event to four days of fun activities for the hospital's young patients. The Extravaganza was organized and funded with help from the Alabama Power Service Organization (APSO). The APSO is an independent, nonprofit organization with ten chapters across the state. More than 4,000 APSO volunteers typically contribute more than 75,000 hours of community service each year. Birmingham magazine and Alabama Baby & Child magazine collaborated to produce the 2011 Parent’s Choice Awards for Birmingham magazine’s May kids' issue. More than 2,500 people took the survey last spring, casting online votes for what they considered the best services and businesses in 65 categories. BPL’s Avondale Regional Library tied with Emmet O’Neal as runners up to Hoover Library for Best Story Time in the Activities category. Congratulations to Avondale’s talented storytellers! 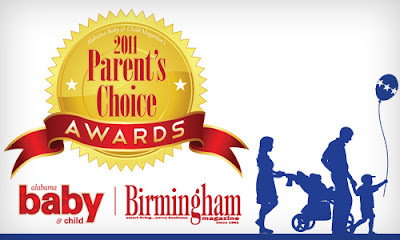 The Parent's Choice Award winners will remain online at bhammag.com for a full year. The Birmingham Public Library is proud to offer the following sample of events for the month of June designed specifically for our teenaged patrons. Please check with your local BPL branch or at www.bplonline.org for more information. The library version of the hit TV show! Central, Thursday, June 2, 2:00 p.m.
East Ensley, Monday, June 13, 3:00 p.m.
Avondale, Thursday, June 16, 2:00 p.m.
Powderly, Wednesday, June 22, 1:30 p.m.
Wylam, Thursday, June 23, 10:00 a.m.
North Birmingham, Tuesday, June 28, 2:00 p.m.
West End, Wednesday, June 29, 1:30 p.m. Chef “E” presents a fun cooking demonstration and tasting. Registration required. Central, Tuesday, June 7, 10:30 a.m.
North Birmingham, Tuesday, June 14, 2:00 p.m.
East Lake, Wednesday, June 15, 12:00 p.m.
Wylam, Thursday, June 16, 1:00 p.m.
Five Points West, Tuesday, June 21, 1:30 p.m.
Springville Road, Wednesday, June 22, 10:00 a.m.
North Avondale, Tuesday, June 28, 1:30 p.m.
Powderly, Thursday, June 30, 1:30 p.m.
East Ensley, Monday, June 6, 3:00 p.m.
North Birmingham, Tuesday, June 7, 2:00 p.m.
Wylam, Thursday, June 9, 10:00 a.m.
Central, Thursday, June 9, 2:00 p.m.
Smithfield, Tuesday, June 14, 10:00 a.m.
Five Points West, Tuesday, June 14, 1:30 p.m.
West End, Wednesday, June 15, 1:00 p.m.
Titusville, Thursday, June 16, 10:30 a.m.
Powderly, Thursday, June 16, 1:00 p.m.
Springville Road, Monday, June 20, 4:00 p.m.
Inglenook, Wednesday, June 22, 3:00 p.m.
Avondale, Thursday, June 23, 2:00 p.m.
Magic Man Larry Moore performs his famous tricks. Springville Road, Wednesday, June 8, 1:00 p.m.
Eastwood, Wednesday, June 15, 2:00 p.m.
Woodlawn, Thursday, June 16, 1:00 p.m.
North Birmingham, Tuesday, June 21, 2:00 p.m.
Smithfield, Tuesday, June 28, 10:00 a.m.
Five Points West, Tuesday, June 28, 1:30 p.m.
East Lake, Thursday, June 30, 12:00 p.m.
Avondale, Thursday, June 30, 2:00 p.m.
A great new resource for digital literacy is now available online. "In partnership with nine federal agencies, the U.S. Commerce Department’s National Telecommunications and Information Administration (NTIA), created www.DigitalLiteracy.gov to provide librarians, teachers, workforce trainers, and others a central location to share digital literacy content and best practices. These trusted groups can, in turn, better reach out to their communities in providing them the skills today’s employers need. NTIA is also partnering with the American Library Association and the Institute of Museum and Library Services to promote the use of the portal by the nation’s more than 16,600 public libraries where, in 2009, over 30 million job-seekers used computers to search and apply for jobs." Continue reading the press release here. • Workforce development materials such as tutorials, presentations, and reports that teach individuals how to find a job, create a resume, and use productivity software such as word processing and spreadsheets. • Curriculum materials such as lesson plans, student handouts, and class exercises that teach basic computer and online skills in formal and informal classroom settings. • Train-the-trainer materials such as presentations, handouts, and exercises used to teach individuals how to teach digital literacy skills to others. • Games and interactive tutorials that teach digital literacy skills to various audiences through active use. 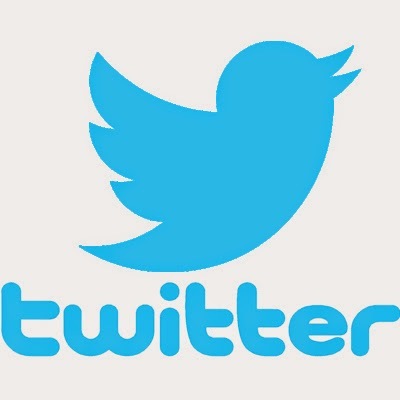 • Reports and articles on a range of digital literacy topics. www.DigitalLiteracy.gov is an online portal that makes it easy to find resources and tools that teach computer and online skills. Practitioners in service -oriented organizations —— such as libraries, schools, community centers, community colleges, and workforce training centers — can provide feedback on and share digital literacy content and practices. Anyone can use the web portal to identify the skills needed for various jobs, locate suitable training, and search for employment. Night Call Nurses or What the Health?! is an original 45-minute comedy written by Dr. Andrew Duxbury of the UAB Center for Aging. It is the story of a struggling radio station celebrating its 75th Anniversary by bringing back the popular radio soap opera, Night Call Nurses. The Baby Boomer producer invites the original actresses back to enjoy the show not realizing that they will steal it and save the day! Contact Sandi Lee at 205-226-3742 or slee@bham.lib.al.us for more information. Wednesday, May 18, noon. ATTENTION TEENS! Beginning on June 1, the Birmingham Public Library (BPL) will begin its summer reading program for teens. Sign up at any BPL location—at any time during the summer—to compete for reading prizes, participate in special events, and enjoy guest artists. Art, juggling, drumming, cooking, martial arts, and forensic science experiments are but a few of the events scheduled this summer. Make BPL a destination for summer fun by signing up on June 1 or any time thereafter. All programs are free of charge. For a list of summer reading programs, pick up Reader at your nearest library or check online at http://www.jclc.org/Reader/2011/summer/default.htm. Are you baffled by U.S. Census data? Do you have a project coming up that requires you to locate, and make sense of, the newly released 2010 figures? Well, the Birmingham Public Library is here to help. On Tuesday May 10th, the library is hosting a workshop that will be presented by representatives of the U.S. Census Bureau’s Atlanta office. The workshop is entitled Census Data and Proposal Writing for Not-for-Profit Organizations. The purpose of this workshop is to give those individuals involved with preparing grant proposals instruction on how to locate current data relating to specific populations which can then be used for community and neighborhood analysis. The workshop will be held in the Arrington Auditorium, which is located on the 4th floor of central library’s Linn Henley Research building. There is no cost and no registration is required to participate. 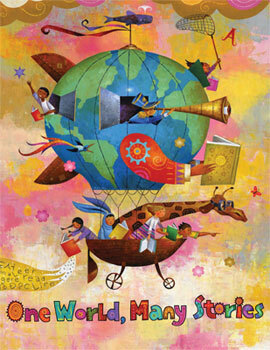 Tuesday, May 10, 2011 from 10am - 11:30am in the Arrington Auditorium at the Birmingham Public Library. Treasures to be found at this exciting event! Gigantic Book Sale June 3-4! • Attend the 2011 Skills and Drills Football Clinic with Jerricho Cotchery and other NFL players on June 18, 2011 at Legion Field. FREE of charge. • Attend the FREE "Club 89" Teen Tailgate Party at Birmingham Public Library on June 17. 2011. Registration for “Score Big” with the Cotchery Foundation ends June 3, 2011. Visit any Birmingham Public Library location for details. What she learns first is how the Information Age has overturned all the old assumptions of the library profession. 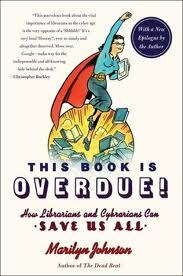 While at first librarians may have feared the computers that threatened to supplant them, a new breed of librarians have dived head-first into the electronic realm, becoming educators and activists for a planet now drowning in information overload. She concludes by speculating that the idea of a library as something that serves a narrow geographic area – a county, a city, a neighborhood – is becoming a thing of the past as the Internet makes borders and distance meaningless. By preserving vanishing pieces of history, defending the public’s right to information and privacy, and making knowledge freely available to all, every library out there, no matter how small, is a benefit to its community and the world. 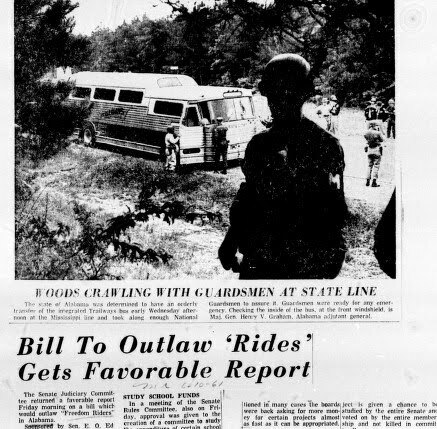 Fifty years ago today, two groups of racially diverse citizens boarded public buses in Washington, D.C. for a trip through the deep South. The Freedom Riders, as they were called, were brave individuals who endured hostility and violence in order to test onerous desegregation laws that divided an entire region of the country. Their bravery set the stage for drastic changes in both societal attitude and legal challenges that would change our nation. The Encyclopedia of Alabama has an excellent overview of this important part of the United States' Civil Rights Movement history. BPL's Digital Collections includes several scrapbooks of contemporary newspaper articles covering the events. PBS will air a documentary about the Freedom Riders on May 16. There is an online exhibit, timeline, biographies, and additional information to accompany this program. Birmingham Public Library's Archives Department contributed to this production. Houston Todd is a Birmingham artist who is the art specialist at Princeton Alternative School in Birmingham. Todd will make a presentation of Ashley Bryan's work that is on exhibit at the Birmingham Public Library. Bryan who was a graduate of Cooper Union Art School in New York City, taught art at Dartmouth University for over 25 years, and retired as Professor Emeritus of Art. Bryan has won the Coretta Scott King Award nine times and received the Laura Ingalls Wilder Medal for contributions to children's literature. Todd has studied the art in Bryan's books and will share illustrations from many of the award winning books. After listening to Todd, you will have a deeper appreciation of the exhibit of Bryan's work. Contact Sandi Lee at 205-226-3742 or slee@bham.lib.al.us for more information on this program. Wednesday, May 11, noon, Central Library, Arrington Auditorium. 2011 marks the 150th anniversary of the outbreak of The Civil War. To commemorate this occasion, the Social Sciences department has put together a display of books, DVDs, and audio books related to the Civil War. 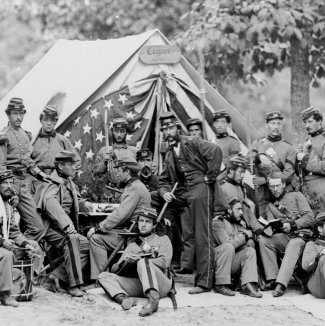 We also have the American Civil War subject guide to help you find even more resources. Stop by today or call us at 205-226-3640! A recent Harris Poll echoed the rally cry of many library supporters, praising the resources libraries provide to affirming their importance in communities. Nearly 80 percent of respondents agreed that libraries deserved more funding. The poll was included in a 70-paged report called “The State of America’s Libraries” released in April. When asked, 96 percent (representing nearly 224 million people) said that by providing free access to materials and resources, libraries play a vital role in giving everyone a chance to succeed, and 94 percent said libraries improve the quality of life. More than 80 percent agreed the library is an important tool for promoting, fostering, and advocating education. And approximately 80 percent of those surveyed agreed that libraries need and deserve more funding. Lady Bird Johnson said, “Perhaps no place in any community is so totally democratic as the town library. The only entrance requirement is interest.” And the majority of those asked agree. Participants also stated that the library’s resources and programs which promote education and learning were among its most valued services, especially during these hard economic times. Nearly 93 percent believe that it is crucial for library services to remain free, and 31 percent of adults rank the library as one of their top tax-supported services. Nevertheless, despite the need and support of patrons for continued free resources, services, and programs, libraries are targeted and are usually the first on the budget chopping blocks. Scott Turow, in his Huffington Post piece, “Let-Them-Eat-Cake-Attitude Threatens to Destroy a Network of Public Assets," wrote, “Millions of Americans simply cannot afford to replace what libraries have traditionally offered for free -- access to books, computers and research assistance. Ironically, the importance of these services is even greater in a time of economic uncertainty." Budget cuts always demand hard choices as local and state governments face hard economic times. But while budgets lessen, the need and demand for free services grow. Libraries are at the front lines of meeting those needs. People come become they want to expand their knowledge and increase their resources, all the while trying to stretch their dollars in a shrinking economy. A library stands as a testimonial to many communities. Your library needs your continued support. Spring Into Gardening at Your Public Library! Spring has arrived, and that means it is time to plant your garden! This month, the Business, Science, and Technology department's display is devoted to gardening. 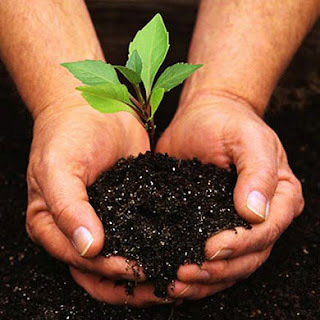 You will find books on how to find that green thumb in you! We have also created a subject guide, Gardening in the South, to help you find more resources. The National Gardening Association lists these as the 5S's to Success for Starting a Vegetable Garden Stop by our gardening display today or call us at 205-226-3690! Dr. Lynn Kirkland and Dr. Deborah Strevy are on the faculty of the School of Education at the University of Alabama at Birmingham. Both have taught children’s literature as well as many courses related to the literacy development of young children. Their brief lecture will focus on the very important role parents play in the literacy development of their children and techniques they may use when reading and working with their children and books. The focus of the remarks will be the award winning literature of Ashley Bryan, which will be on display in the Birmingham Public Library 4th Floor Gallery from April 11-May 20. Contact Sandi Lee at 205-226-3742 or slee@bham.lib.al.us for more information about this program. Wednesday, May 4, noon.